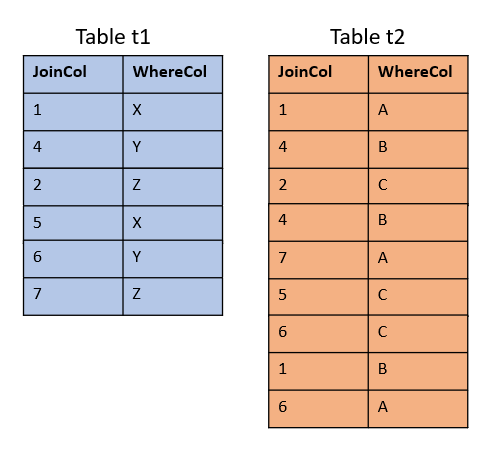 The two tables are joined on the column JoinCol, while WHERE conditions for filtering are done with the column WhereCol. Other columns are not shown to keep the sketches small and simple. Now say these two tables are stored on a three-node cluster. Again, for simplicity only active nodes are on the sketch – no reserve nodes or license nodes. We also ignore the fact that small tables will be replicated across all active nodes. Here every row finds a local join partner on the same node so no network communication between the nodes on behalf of the join is required. The performance with this local join is much better than with the global join although it’s the same statement as before. This distribution is actually worse than the initial random distribution! Not only does this cause global joins between the two tables as already explained, statements like e.g. will utilize only one node (the first with this WHERE condition) and that effectively disables one of Exasol’s best strengths, the Massive Parallel Processing (MPP) functionality. This distribution leads to poor performance because all other nodes in the cluster have to stand by being idle while one node has to do all the work alone. Distribution on JOIN-columns leads to local joins which perform better than global joins: Do that! Distribution on WHERE-columns leads to global joins and disables the MPP functionality, both causing poor performance: Don’t do that!